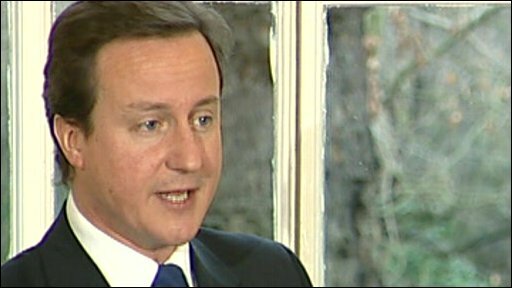 Conservative leader David Cameron has announced plans to offer £4bn in tax cuts for savers and pensioners. He would scrap taxes paid by basic rate taxpayers on savings interest and raise the level of non-taxable income for pensioners by £2,000 a year. Labour said it was "economic madness" and amounted to spending cuts, the Lib Dems said it was a "fake giveaway". Savers have suffered as interest rates have fallen to a 57-year low of 2%. A further cut is anticipated on Thursday. The Tories propose to end the 20% tax paid by basic rate taxpayers on savings' interest, should they win power at the next general election. According to the Tories, anyone with savings who has earnings or pension income of less than £43,875 will be better off. They say those most dependent on income from savings would benefit most and someone with annual pension income of £12,000 would save £200 a year. Abolish 20% tax paid by basic rate taxpayers on interest earned on savings. Higher earners would still pay 40%. The amount of income that people aged between 65 and 74 would receive tax-free would rise from £9,490 to £11,490 while for the over 75's, tax-free allowances would rise to £11,640. This would enable a 65-year old with £14,000 in pension income to save £400 a year, the Tories argue. Mr Cameron said his plans were designed to create a "less materialistic" society based on a culture of "save, save, save" rather than "spend, spend, spend". "We need to make a really big change in Britain from an economy built on debt to an economy built on savings," he said. Mr Cameron said the tax cuts - estimated to cost about £4.1bn - would be paid for by restricting public spending increases across most of government in 2009-2010 to 1% in real terms. This would represent a reduction of about £5bn in the overall rise in public spending - from £30bn to £25bn - planned by Labour. However, existing Labour spending commitments for health, schools, defence and international development would be left unaltered. One tax expert said the proposals were a "good way" of putting money into the pockets of key groups in society. But Carl Emerson, of the Institute of Fiscal Studies, said it was unclear whether people would choose to spend the money or save it and there was a chance that it would result in less money flowing into the economy. He also said it would result in a "very sharp slowdown" in the rate of spending growth across many areas of government. Mr Cameron said the country faced a "grim" future under Gordon Brown and called again for a general election any time this year. Labour's economic strategy had failed, he said, and the country was facing a "catastrophic legacy of debt and disrepair". "Our vision of a good future is of a less materialistic country, more concerned with people and our relationships; a contributor society not a consumer society," he said. Mr Cameron also announced plans for a review of broadband services - with the aim of giving every home access to high-speed fibre optic broadband within 10 years - and for a "green" stock exchange to help fund new environmentally friendly businesses. Earlier he called the temporary 2.5% VAT cut a "joke". Mr Cameron told BBC Radio 4's Today that Mr Brown might as well have gone out and burnt the money and said he felt like "shaking the prime minister". But Chief Secretary to the Treasury Yvette Cooper told the BBC the Conservatives were out of step with the rest of the world. She said: "What David Cameron is proposing is spending cuts during a recession. "I mean, this is cuts in support for the unemployed to get back to work, cuts in support for training and apprenticeships, cuts in support for business, or housing, transport, regeneration. "I think it's economic madness, and no other major government in the world is considering this, quite the reverse". The Lib Dems, who want to lower the basic rate of income tax, said the plans would only result in a marginal saving for people on average incomes. Party leader Nick Clegg said: "This is a fake giveaway. It only amounts at today's interest rates to an extra 40p on someone saving £100. "What people need is much more money back in their pockets now. That's why we have a plan to deliver big, permanent, fair tax cuts." BBC political editor Nick Robinson said all three of the main parties now backed tax cuts but disagreed over which taxes get cut, who should benefit and how they should be funded. Meanwhile Prime Minister Gordon Brown has been discussing help for businesses, as as a prelude to a three-day tour of England and Wales, which will culminate in a jobs summit in Downing Street next week. Mr Brown said the UK was facing a "testing" year but that Labour's investment in housing and transport and its planned focus on creating jobs in new sectors of the economy was an "essential" response to the downturn. "I believe with the right policies that we can build a better tomorrow while also immediately addressing the challenges we face today," he told a meeting of business groups and union leaders in London. To do otherwise and to let the downturn run its course - the approach the prime minister has accused the Conservatives of taking - would be "socially divisive and economically mistaken". "When markets fail the government has a responsibility to act." The government also said it was mulling over further plans to encourage UK banks to raise lending to firms and households.